Williams was not an enthusiastic model and she only agreed to the job on the condition that her identity would remain secret. Williams went to Eakin’s house to model for Morgan on five separate occasions in November 1876, when she was eighteen years old. 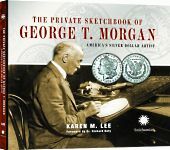 Supposedly Morgan used the sketches from these sessions as the basis for Lady Liberty, although some accounts say he also used a daguerreotype (an early photograph) of Williams as well. Unfortunately for Williams, she did not remain anonymous for long. In 1879 a Philadelphia newspaper revealed that she was the “Silver Dollar Girl,” and from then on Williams found herself in the public spotlight. She received thousands of offers for public appearances and acting jobs (which she refused) as well as many letters and visitors. According to some accounts she was fired from her job as a teacher at the House of Refuge because of the publicity, and according to others the publicity brought about an end to her engagement to be married, but there is some controversy about both of those stories. Williams never married, and in 1891 she became a “teacher of kindergarten philosophy” at the Girl’s Normal School in Philadelphia. 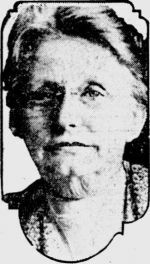 She rarely spoke about the speculation surrounding her connection with the Morgan Silver Dollar except as “an incident in my youth.” In December 1925 she suffered a bad fall, and she died on April 17, 1926 after suffering a stroke. She was sixty-eight years old. Many people believe that Anna Willess Williams never was the model behind Lady Liberty and that the reason Williams refused to talk about the speculation was because it wasn’t true. In a letter that is believed to have been written by Morgan’s wife to one of their daughters, the letter writer writes that Morgan had “just made up the obverse (front side of the coin) himself.” The people who support this theory point to the fact that Lady Liberty’s profile looks significantly more mature than that of an eighteen year old girl… but that could be explained by another speculation that Charles Barber, then Chief Engraver at the U.S. Mint, was jealous of Morgan’s work and that he deliberately aged the profile of Morgan’s Lady Liberty. 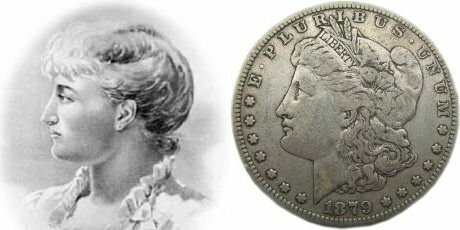 My own personal belief is that a comparison between a photograph of Anna Willess Williams and the profile on the Morgan Silver Dollar answers the question. They look almost identical. Filed under Coin Models, Morgan Silver Dollar.